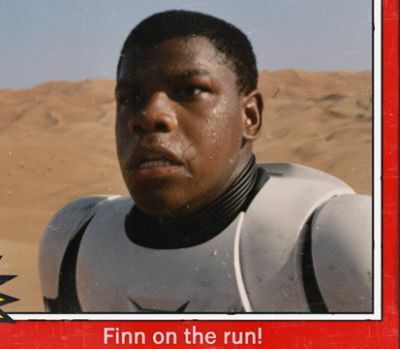 Names of the Star Wars: The Force Awakens Characters Revealed! Two weeks ago, the teaser trailer for Star Wars: The Force Awakens debuted online, and with it came out first look at several new characters set to appear in the upcoming sequel. 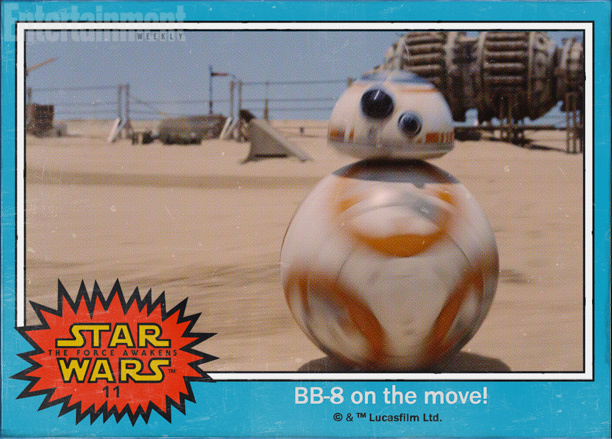 Now, Disney and Lucasfilm (via EW) have come up with the genius plan to introduce fans to these new characters through images styled after Topps trading cards. Check them all out below! Among the names revealed are Oscar Isaac’s character as Poe Dameron, Daisy Ridley’s character as Rey, John Boyega’s Stormtrooper character as Finn, the unseen Sith with the fancy new lightsaber as Kylo Ren, and the infamous “ball droid” as BB-8. One week from today marks one year until the release of the upcoming film, might we be getting more trading cards on that date? Check back and see! Also starring Harrison Ford, Carrie Fisher, Mark Hamill, Anthony Daniels, Peter Mayhew, Kenny Baker, Adam Driver, Andy Serkis, Domhnall Gleeson, Max von Sydow, Lupita Nyong’o, Gwendoline Christie, Crystal Clarke, Pip Anderson, Christina Chong and Miltos Yerolemou, the J.J. Abrams-directed film will debut in theaters on December 18, 2015.